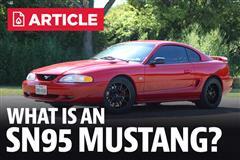 Late Model Restoration explains this Mustang and why it's considered an SN-95. Follow along as we walk through the history of the 1999-2004 Mustangs. This is a code name for 1999-2004 Mustang. 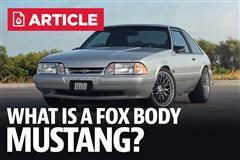 They are technically SN-95s and were still built on Ford's Fox platform. What Does New Edge Stand For? 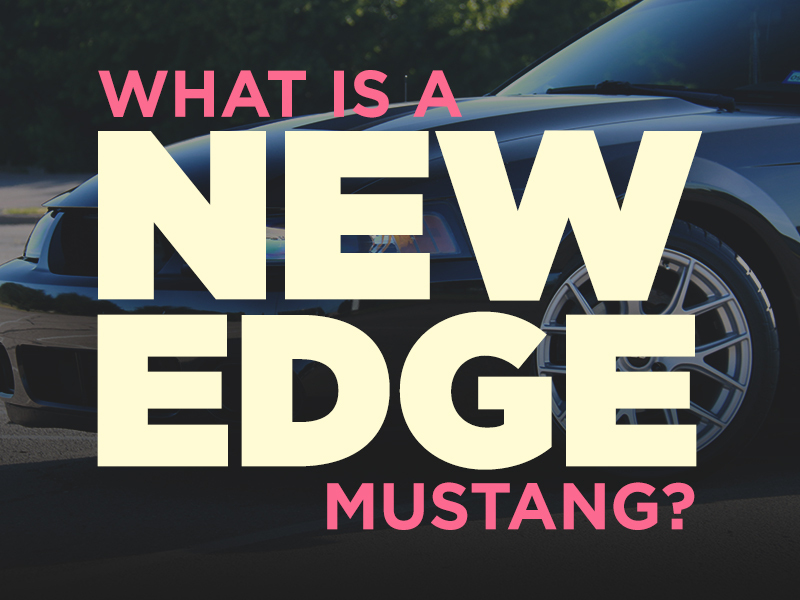 "New Edge" was a term used to classify the later SN-95 Mustang's redesign in 1999 that featured sharper edges than the previous Mustangs. 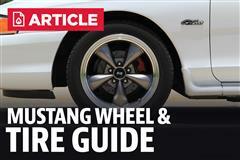 The 1994-1998 Mustang's soft body lines were replaced with sharp, edgy body lines. While still being classified as an SN-95 Mustang, the New Edge took on a great new look while getting a small engine upgrade and interior features to match. 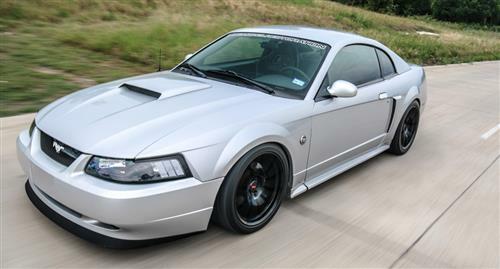 As mentioned before, the exterior was much sharper than the previous Mustang giving a meaner look to the 1999-2004 Mustangs. While Ford carried over the 4.6L motor, a "performance increased" cylinder head was used to squeeze more power out of the 2 valve motor. The interior had minor upgrades but stayed mostly unchanged. 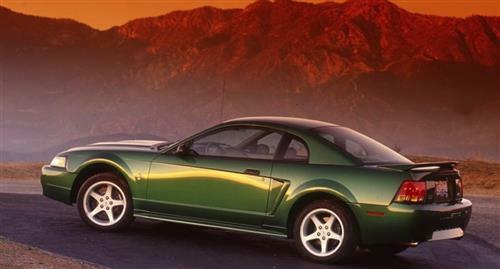 While the Saleen and the SVT Cobra were carried over, Ford also brought back the Bullitt and Mach 1! The most noticeable difference for the new 1999-2004 is the sharper, more edgier body style. 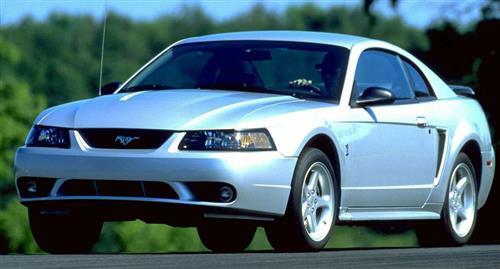 1998 was the last year of the smooth body lined Mustang of the 90's. The front bumper on early SN-95s had a very smooth look which was axed in favor of a more defined front end. 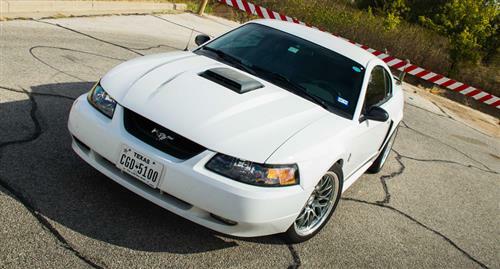 This paired perfectly with the new hood which was available with and without a stylish hood scoop that defined the New Edge Mustangs. The headlights were transformed from a two piece assembly to a one piece assembly. These were available with a chrome housing (99-00) and a black housing (01-04). 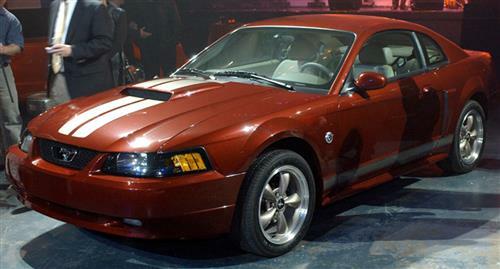 The sides of the New Edge followed the same sharp body lines as the front bumper and flowed into a faux side scoop seen first on the 94-98 Mustangs. Finishing off the car was a rear bumper that had been redesigned from a rounded look to a boxier rear end. The tail lights were also redesigned from the round vertical style to a more classic styled 3 row vertical rectangular lens. An optional spoiler could be added as well that paired nicely with the hood scoop for a race inspired look. Carrying over most of the same features as the 1994-1998 Mustangs, the New Edge did have a few minor improvements over its earlier models. 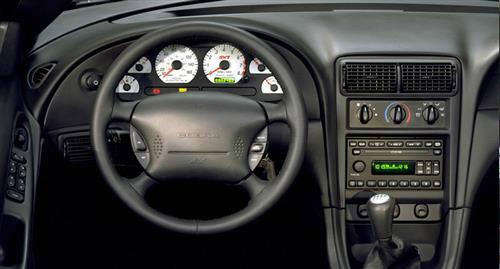 They still featured the same dual cockpit dashboard used in 1994 but the center dash was changed over the years to make room for the Mach 460 and Mach 1000 sound systems. Leather and cloth options were available in different colors to complete the interior look. 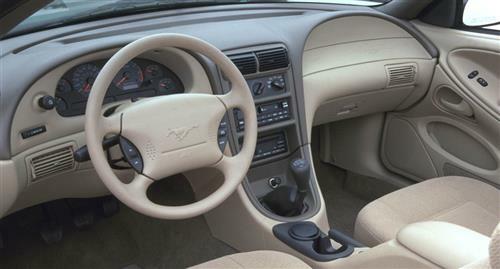 Most 94-04 interior can be swapped out between the years to mix and match new colors into your interior. 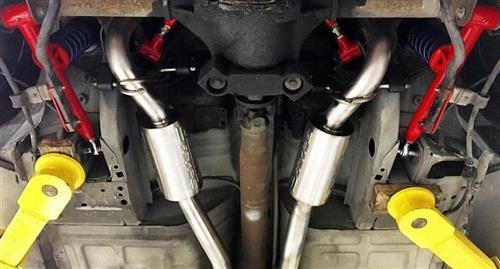 While the Mustang's MacPherson suspension setup remained in place, the SN-95/New Edge body got longer lower control arms, new spindles (sought after by Fox Body owners for 5 lug swaps) anti roll bars, upgraded shocks/struts, and few smaller changes. Ford's focus on reducing NVM and improving the car's handling led to these improvements and gave the SN-95/New Edge better handling over the Fox Body. 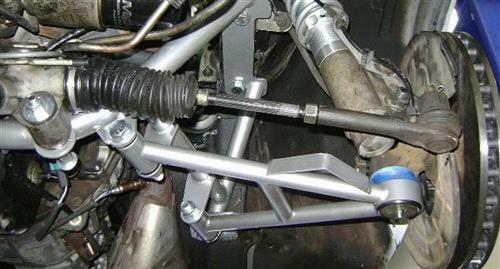 All 1994-2004 Mustang's suspension was the same. 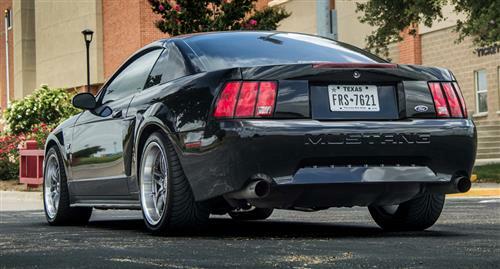 Throughout the 1999-2004 Mustang lifetime, a few various V6 and V8 options were available including a supercharged V8! Here we lay out the various engine options for the New Edge. 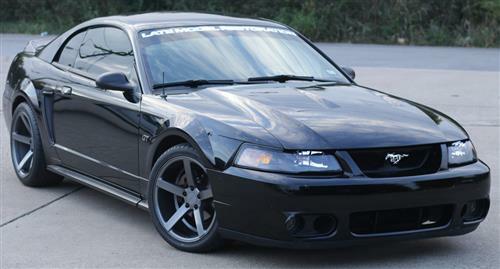 After the great success of 1998 Cobras, SVT engineers knew they had to take the New Edge and give it an SVT touch. Outfitted with a 4.6L 4V engine, the 1999-2001 began hitting the streets with a newly designed front bumper, hood, and rear bumper. 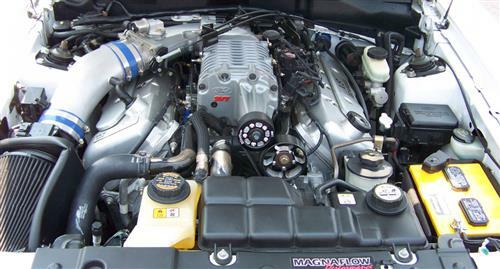 The 99-01 Cobra motor was advertised to put down 320 HP and 317 TQ from its naturally aspirated 4.6L 4 valve motor. Why Are There No 2000 Cobras? 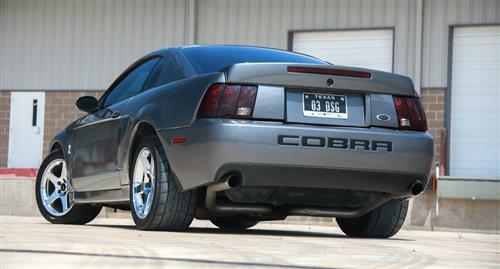 While the new 1999 Cobra was fun, owners soon found out the 0-60 mph times were in fact slower than 1998 Cobras. After dyno testing, it revealed that the actual output was closer to 285 HP and not 320 HP as Ford had claimed. In August 1999, Ford halted the sales of unsold 99 Cobras at dealerships and recalled each 1999 Cobra that had been sold. 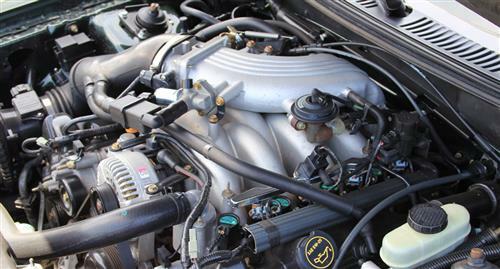 To rectify the lost horsepower issue, Ford replaced the intake manifold, certain computer components, and the factory cat-back to dyno 320 HP at the crankshaft. 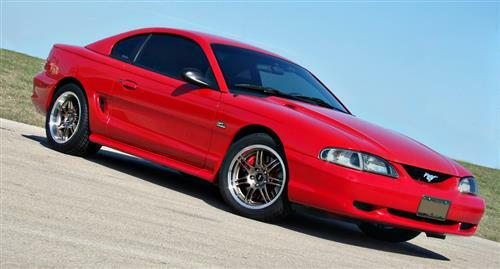 The 2000 Cobra R was the fastest factory Mustang produced in its time putting down 385 HP from a naturally aspirated 5.4L motor. Developed by SVT, the Cobra R was a racer's dream Mustang. 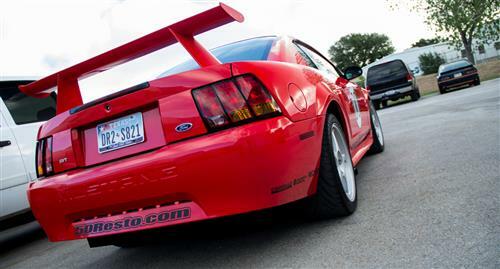 A lightweight Mustang with big brakes, high horsepower, Recaro seating, front air splitter, high mount rear spoiler, and a track ready suspension caught the eye of everyone it passed. Partnering with Warner Bros., Ford honored the 1968 Fastback driven by Steve McQueen in the movie Bullitt, by creating a special edition Bullitt Mustang. The Bullitt was offered only in 2001 in three colors, Dark Highland Green, True Blue, and Black for a total of 5,582 being built. In addition to these colors, the Bullitt was different from the GT in many ways from exterior to interior to engine accessories to lighting. 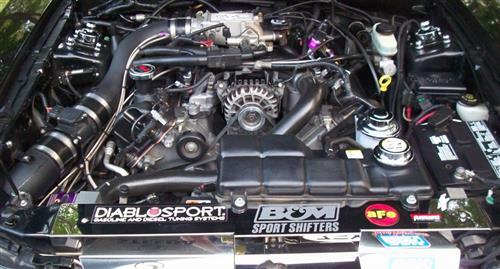 It shared the same 4.6L 2V but had a unique intake manifold, underdrive pulleys, and high flow mufflers. 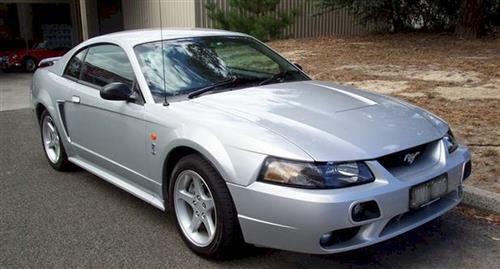 While there is great debate on the existence of a 2002 Cobra, there were 100 made here in the US and exported to Australia. 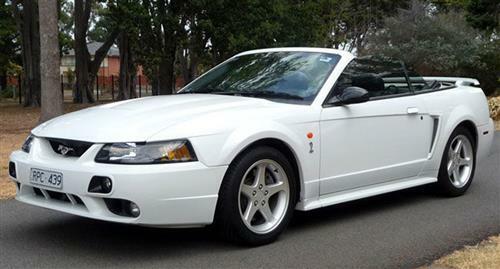 The 2002 Cobra had many different features not seen on US based cars due to regulations of Australia. 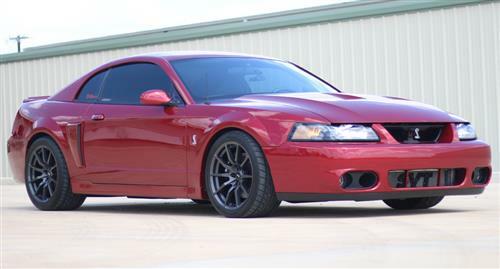 Arguably one of the greatest and most powerful Mustangs ever produced, the 2003-2004 Cobra (nicknamed Terminator) is still one of the most popular Mustangs among enthusiasts. While the engine was similar to the 4.6L 4V found in earlier Cobras, the 03-04 featured an Iron block with forged rods and an Eaton supercharger that put down 390 HP & 390 TQ. 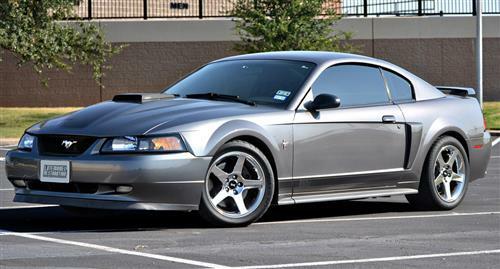 SVT engineers ditched the 99-01 styling and developed a perfect mix of smooth and sharp for the new 03-04 Cobra. A unique interior completed the overhaul which added to the reason the Terminators are so popular. 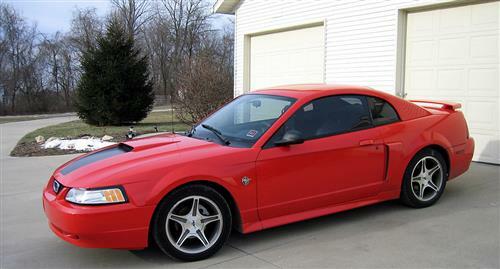 In 2003, Ford engineers brought back the Mach 1 as a package available for purchasing. The Mach 1 dates back to 1969 and was a wildly popular model. 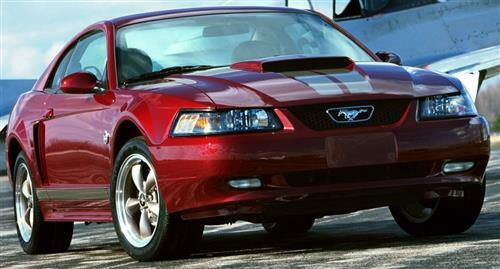 Fast forward to 2003 and the Mach 1 was getting the same great reaction. 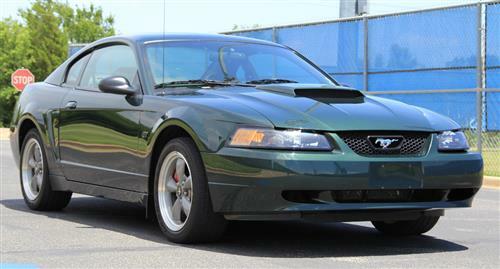 The Mach 1 shares alot of the same features as the Bullitt but had some major differences. Unlike the Bullitt, the Mach 1 received a 4.6L 4V that was built on an aluminum block with the same high flow heads as the 03-04 Cobra. 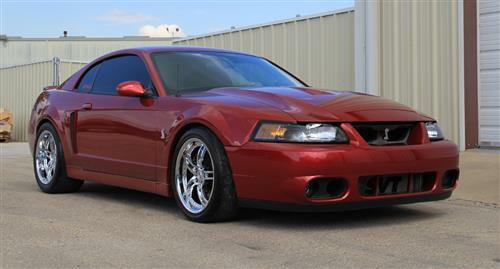 The most noticeable difference and the most desirable is the Mach 1 exterior package. 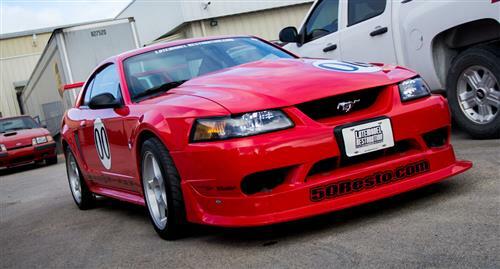 While keeping the same body parts as a GT, it featured a Shaker hood, Mach 1 graphics, and a black painted spoiler. 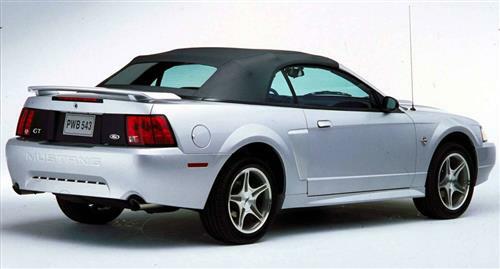 In 1999, a 35th anniversary edition badge replaced all fender emblems to mark the 35th anniversary of the Ford Mustang. A limited edition 35th anniversary package option featured a body-colored hood scoop, rear spoiler, side scoops, and rocker panels. A blacked out deck lid panel between the taillights and 17x8" five spoke wheels were also added. The interiors featured black leather and vinyl seats with silver inserts and a pony logo. Adding to the interior was an aluminum shift knob, 35th anniversary gauge cluster, silver and black floor mats with a 35th anniversary logo, and silver door trim inserts. 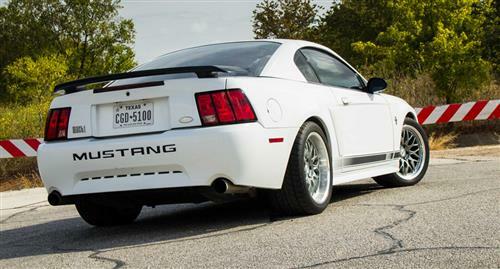 Marking the 40th Anniversary of the Mustang, Ford released all 2004 Mustangs with special 40th Anniversary badges on the fenders in place of the "GT" from previous years. A special 40th Anniversary package was also made available at the low price of $895 for both standard and GT editions. This special edition featured the same fender emblems, exclusive interior with "40th Anniversary" floor mats, painted folding exterior mirror (from 03-04 Cobras), cloth convertible top, Arizona Beige painted Bullitt wheels, & Arizona Beige graphics. This package was only available in Crimson Red, Oxford White, & Black.